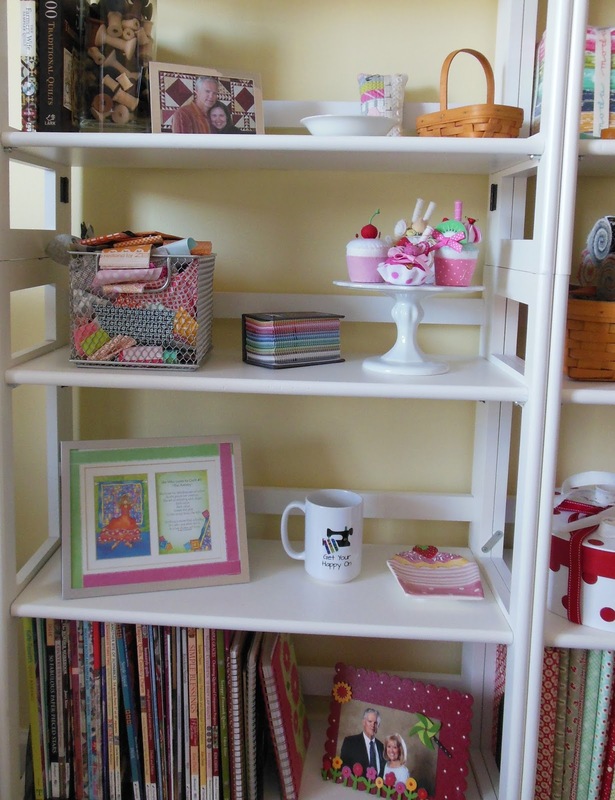 I've completely lacked focus this week in my sewing room. I'm not really working on a project, my goal is to get caught up on piecing the backs and bindings for a dozen or so quilts I've finished. I seem to be doing anything but, so here's what I have been playing around with and thinking about. 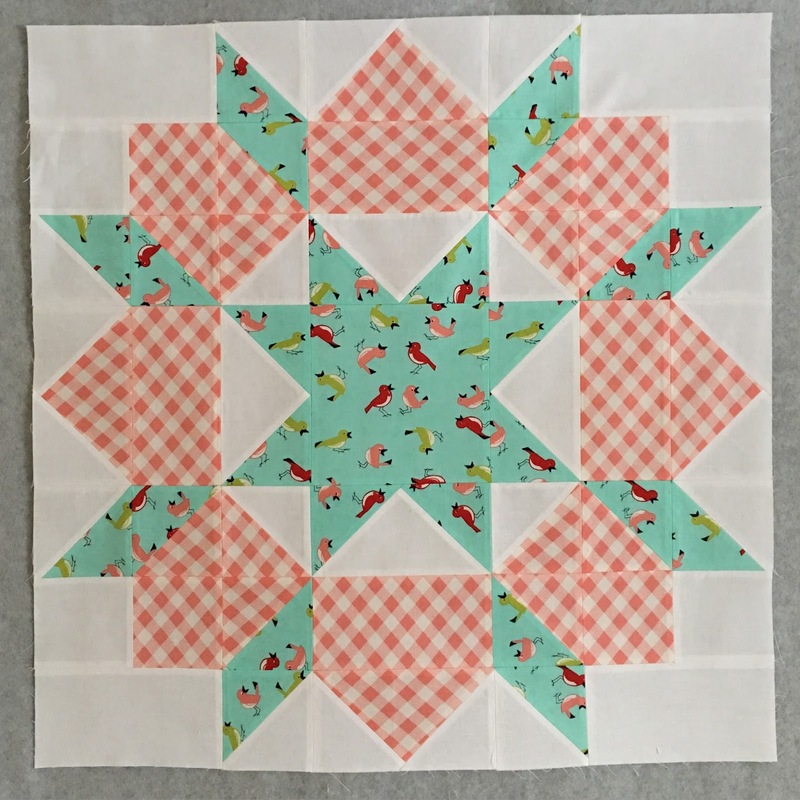 Remember this quilt from my 2016 Goals post? I have an update. The pattern is called Village and is currently available. Look for it at your local quilt shop or buy it online, the Fat Quarter Shop currently has some in stock. (click here) It's a Miss Rosie's Quilt Co pattern and uses charm packs. It finishes at 69" x 75". See that wire basket full of scraps, that's where I stored all the scraps from my 2015 projects. My goal was to use those scraps to make Village, and name it 2015 Village. But now that I have the pattern I've come to realize those scraps aren't big enough to make the village houses. So I'll save the 2015 scraps for another project. I don't have many charm packs, but I do have some layer cakes, so maybe I'll cut into some of those for my Village. Another thought I had is to make sure I have bigger scraps for 2016 and go for a 2016 Village. There's just something about a single quilt made from all the fabric I used in a year that appeals to me. Stay tuned. 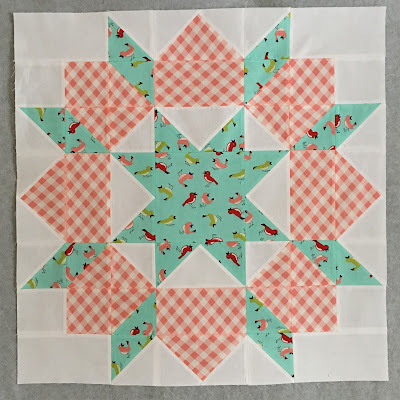 Yesterday I decided to make a Swoon block, using Vintage Picnic by Bonnie and Camille for Moda. I have no plans for it, but it sure was a lot more fun to piece than a quilt back. Frivols #6 showed up this week. The tin is really cute, it has strawberries on it. 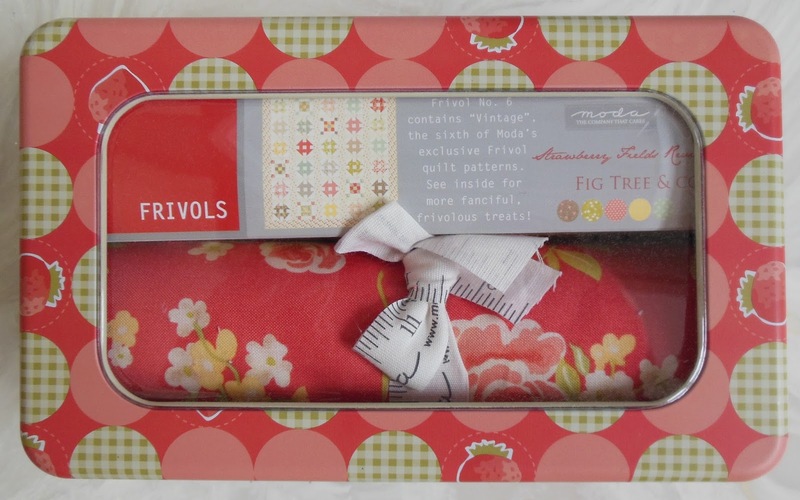 It's the Fig Tree Frivols, the fabric is Strawberry Fields Revisited. I sure was happy some strawberries came to visit. In another effort to avoid piecing quilt backs I opened the tin, (shocking I know) and made a 6 inch alternate block. I went through a Fig Tree phrase a few years ago and decided I had enough Fig Tree quilts in my house to last a lifetime and hadn't bought any Fig Tree fabric since. 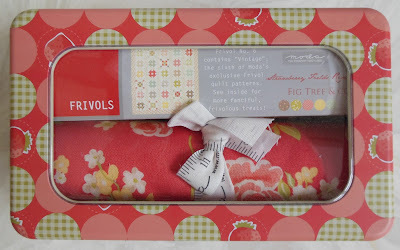 But I found Strawberry Fields Revisited a nice fresh change of pace, I enjoyed working with the fabric. I plan to make an assortment of 4 and 6 inch blocks and piece them into some sort of wall hanging. Summer Wind is out and on my daughter's bed. I love the look of that quilt on her white wicker bed. Village would be fantastic to make, and especially in your year fabrics. Have a great weekend, Thelma. 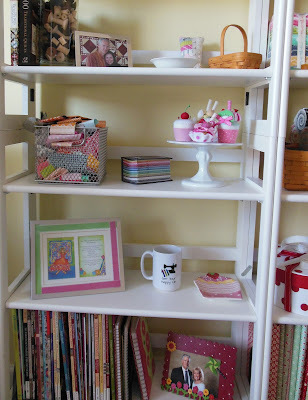 I am still in the Fig Tree phase, I bought a jelly roll and some charm squares in Fig Tree. 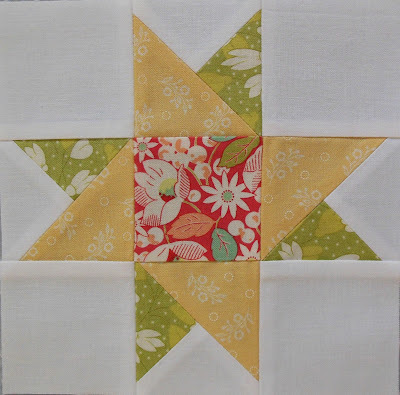 I love the village pattern, it would be nice to use scraps from the year, I will have to get that pattern. Thelma, I do the SAME thing - in order to avoid finishing backings, etc, I move on to a new project!!!! But you are an amazing powerhouse of a quilter - you finish so many quilts! Let's crack open that FRIVOLS! I have mine waiting for me this weekend. Beautiful bits of randomness. I also enjoy seeing what you are working on. I've been procrastinating on piecing a back for a quilt that I just finished for my niece. Finally made myself do it yesterday! And I made the binding. Now just one more to do. Hmmm...maybe I'll just buy a wide back and forget about it! I have procrastinated on backings long enough for there now to be lots of 108" choices! It's all good! Just this week I pulled out one from last year and ordered the backing. I haven't opened my Frivol...just what am I waiting for! Thanks for leading the way! I am drooling over that Summer Wind quilt... and the whole bed too! I see you are famous over at "A Quilting Life"... so happy for you!